Kuber Ventures CPD Qualifying Financial Planning Seminar helped Advisers understand the increasing importance as financial planning tools within their offering. 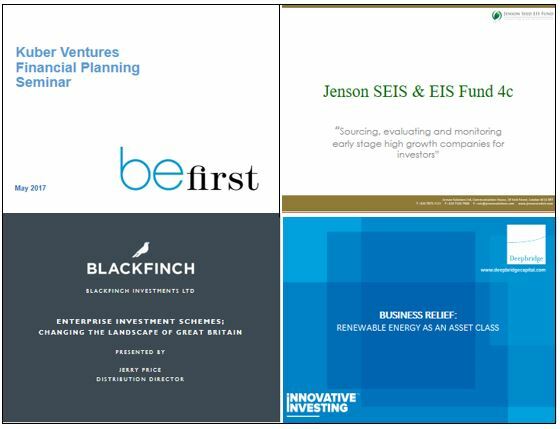 The Seminar highlighted that good planning and timing are key ingredients to successful EIS/SEIS investing and investing early affords a client the opportunity for more, possibly stronger investment opportunities. Kuber, lead by Dermot Campbell CEO illustrated the importance of diversification across today’s tax efficient investment environment and how diversification might work with existing clients. Also outlined was the core aim of the platform and how it works in terms of, achieving diversification and simplified administration through to online consolidated reporting. Sean Burrows from Kuber also presented a number of client scenarios highlighting the advantages of the platform approach. The Seminar also featured guest contributions from Paul Jenkinson, of Jenson Solutions and Andrew Aldridge of Deepbridge.